Just west of Mexico City, you can find skyscrapers that house transnational businesses, private universities, shopping malls and luxurious residential areas. All of these make up the Santa Fe area, a commercial part of the city that attracts tens of thousands of visitors on daily basis. While its popularity appears good for business, it is also resulting in mile-long traffic jams due to poor access. The origin of this problem is partially a product of Santa Fe’s boom in development. Santa Fe began as a sand mine, transformed into a landfill, and then quickly grew into its current state—all in just over 50 years. As Santa Fe rapidly expanded, private cars owned by the Mexican upper classes flooded the streets; meanwhile, public transport to the area remained insufficient and inefficient, a combination that has resulted in severe traffic problems. In response, the Mexico team of WRI Ross Center for Sustainable Cities took up the challenge, developing a network that encourages businesses and universities to adopt sustainable mobility practices. While good for the environment, these practices also aim to reduce traffic congestion in the Santa Fe region. The result of this endeavor is Optimo. “We see an important target in the private sector: nearly a million daily trips are made in Santa Fe and, of those, about 65 percent are corporate trips” explained Gustavo Jimenez, Operation and Planning Transportation Manager at CTS EMBARQ Mexico. In short, the Optimo Network was created with the objective of inspiring businesses to help change mobility in Mexico City. The network allows businesses to share ideas, success stories and lessons learned, and provides a space to coordinate strategies between enterprises, like shared parking and shuttles. As cities grow, corporate mobility is becoming an increasingly salient issue, especially as—according to Gustavo—an employee spends about 30 percent of his/her income on transport and spends about three hours a day commuting to his/her destination. “The biggest challenge of the network is to make the companies feel responsible for the mobility of their employees, and to make them take concrete actions such as promoting car sharing, working from home, staggering hours and fostering alternative business transportation routes. 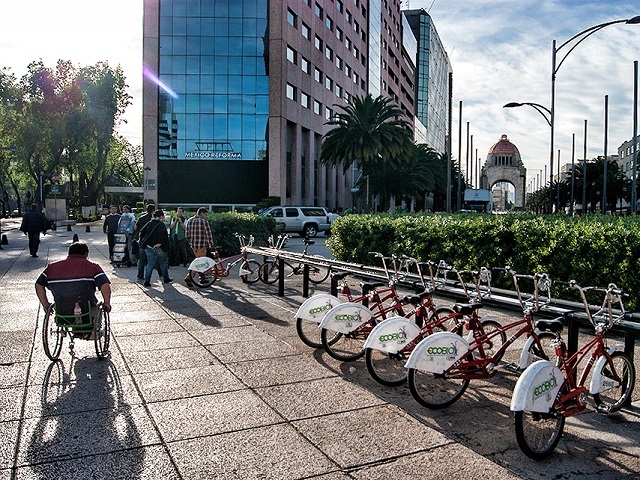 [Optimo] must also convince them to invest away from the car and invest instead in sustainable transport, by giving their employees Ecobici Passes (used for the bike-sharing system in Mexico City)” said Gustavo Jimenez. Productivity increases when companies encourage employees to share cars or to use public transportation. Indeed, once individuals move away from person vehicles, they are less stressed and can use this time for relaxing, reading as well as studying or working. “Mobility is closely linked to how employees feel at work,” says Jimenez, “since long and congested commutes produce workers who get to their destinations tired, stressed, worried and overwhelmed, which reduces productivity and the quality of their work. Studies indicate there’s a 10 percent reduction in productivity if you’re stressed about mobility issues” he explained. The goal is for the private sector to invest in mobility plans that, instead of privileging parking lots, use these funds to subsidize ride sharing and incentivize public transport. After all, According to research by ITDP Mexico, office buildings in Mexico City allocate an average of 42 percent of their land for parking spaces to support employees’ current transport habits. “There are many challenges for corporations seeking to adopt sustainable transportation. One of them is that they don’t fully understand the impact of providing it to their employees,” Gustavo summarized. However, the traffic and congestion in Santa Fe is evidence enough of the negative impacts of not taking action to promote sustainable transport. The most effective way to drive down commute times and create safer roads is to have both businesses and governments work together. Don’t miss the panel “Optimizing Mobility” on Monday October 12 in the Portland Auditorium, during the XI International Conference on Cities and Transport. Several company representatives that have adopted business models of sustainable mobility will participate, including Dr. Juan Pablo Bocarejo, a recognized expert in the field in Latin America, who will moderate the discussion.